A sweaty workout is good for mind, body and soul. But when it comes to your skin, an all-out aerobic exercise session can be a mixed bag—unless you have the right after workout cleansing and replenishing skin care routine. Getting your blood pumping is great for circulation; you’ll get that healthy skin glow we’re all seeking. But all that sweating can leave you and your skin dehydrated (even if you drink plenty of water), and you’ll end up with increased risk of clogged pores. Experts say that with the right cleansing and moisturising steps, you can help your skin recover after a tough yoga, cycling or boot camp class — and take that hard-earned healthy skin glow up a notch. After a workout, your top priority is cleansing. Cleansing to remove dirt and oil is important, according to Neutrogena’s experts because remnants of makeup and dirt can mix with oil and sweat, leading to irritation and clogged pores. So, careful and thorough washing is essential. 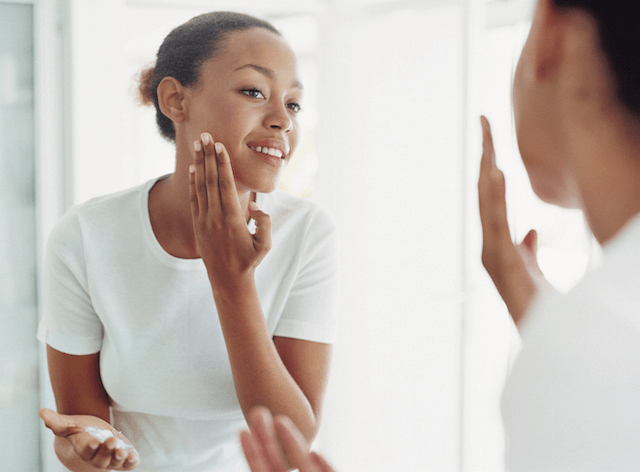 It’s ideal if you go makeup-free at the gym to keep skin as clean as possible —but if you must have a little coverage, choose a light base with a bit of salicylic acid to help keep pores clear. But, whether you choose to sport makeup during your spin class or not, you’ll want to suds up immediately after sweating. You can choose any cleanser you prefer, but a pack of cleansing wipes offers the easiest spill-proof solution for your gym bag. Plus, the texture of the fabric wipes works with the product’s cleansing ingredients to gently remove sweat, dirt, oil and make-up from your skin. Next step to post-sweat skin recovery? Moisturiser, which can replenish dehydrated skin and leave it smooth and radiant. In addition to guzzling water to replenish your body, you’ll want to use a topical moisturiser to draw all that moisture that you lost during your workout back into your skin. However, when you’re likely still sweating, you’ll want to make sure that any moisturiser you apply is non-comedogenic — meaning it won’t trap bacteria and clog pores, causing breakouts. Conventional moisturisers can be greasy because they sit on top of the skin creating a shield to prevent water loss and make it feel soft. A better strategy is to use moisturisers that deeply hydrate the skin from the inside out to lock in that glow and provide longer-lasting suppleness. One option is a product like Neutrogena® Hydro Boost® Gel-Cream, which features Hyaluronic Acid, a compound that exists naturally in your skin to help it hold onto moisture, and sinks quickly into the skin, leaving behind no greasy residue. Be sure to add the SPF product of your choice before you hit the streets! Just as all that cardio will ensure a healthier heart, regular use of a broad-spectrum product that’s rated at least SPF 30 will ensure your hard-earned glow is healthy and protected. Daily sun care is essential to prevent damage, premature ageing and skin cancer. © Johnson & Johnson (New Zealand) Limited.